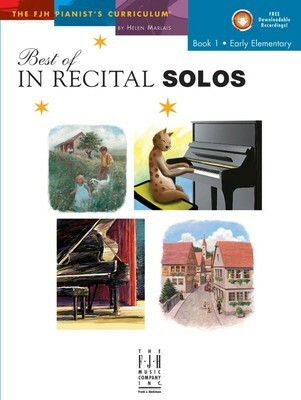 We?ve chosen the best solos from the In Recital® series, and put them under one cover. Book 1 features 13 pieces: eight original solos, three folk tunes, and two classical arrangements. There is a wide-range of styles: lyrical pieces from Melody Bober, Mary Leaf, and Elizabeth Greenleaf;a rag from Jason Sifford; a jazz piece from Christopher Goldston; and a gospel number from Edwin McLean. Some have optional duet parts. Free do wnloadable recordings assist in preparation and serve as a motivational tool.